I've been a little out of sorts this past month or so. Not so much in a bad way, but with all of these major changes happening in my life right now I've found myself floundering while I wait for some of the details that are out of my hands to finish processing. In that way, I've found myself with a distinct lack of direction, even though there is so much that I want to accomplish. Enter Danni from Oh, Hello Friend. As a lover of lists I've decided to participate in her Twelve by 2012 project to, hopefully, get in gear before the year is out. My list is primarily little projects that have been sitting around (some for years) just waiting to be finished. When the new year begins, I'd like it to dawn on a fresh start of sorts. 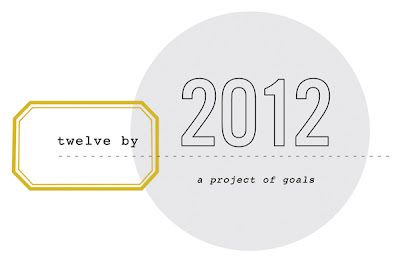 What would you like to accomplish before the year is up? 1. Write letters. At least twelve of them. 2. Finish folding cranes with the paper I have. 3. Figure out how to do a fantastic, metallic eye look. 4. Submit at least one photo to Somerset Life. 5. Go apple picking and bake a pie with the results. 6. Make truffles again. Experiment with new flavors. 7. Finish knitting a scarf. 9. Take at least one photo a day until the end of the year. 10. Catch up completely with my Google Reader. 11. Finish memorizing up through at least through James 1. 12. Debut the new layout for Quirky Charm and Quirky Girl's Las Vegas. I'll definitely put up a post! I used to be pretty successful at it, but it's been years. Hopefully I'll have some tips to share :) Thank you! I love #1, writing letter (and receiving them) are some of my all time favorite things. Also I love #5 and I think you should do a post with your recipe. I have had such a hard time finding a recipe that I love. Good luck with your list! @Lizzie I'm hoping that #1 will get me back into the habit again. I love writing (and receiving) them, but I never seem to make time for it. I'll definitely post a recipe for #5! I have a promising one from the local orchard itself that I'm hoping is a winner. @Lydia Thank you! I love how varied your list is as well, I'm looking forward to see your progress with it too :) All the best with yours as well! #1 sounds wonderful! Writing or receiving a good old fashioned letter is such a wonderful thing and brightens anyone's day. Wishing you all the best with your '12'!! @Danni I'm definitely hoping to! I made it out to one over the weekend, but they were all out of apples. Thank you so much for hosting the project! This was exactly what I needed to get in gear for the rest of the year.